What is the Rice Test and What is it For? One of the biggest dilemmas that San Francisco breast augmentation patients face is what size breast implant they want. It is a choice that they will have to live with unless they want to go through another breast surgery, so most try to make the right choice the first time. Breast augmentation specialist, Dr. Miguel Delgado helps his patients determine the correct size by showing them how to do the “rice test”. One cup of uncooked rice equals 250cc’s of volume. So you might want to start with 1 ¼ to 1 ½ cup of rice for each stocking, do not tie off too tight, you want the rice to be able to move around a bit. Then lay a bra on a table top facing you, set each bag of rice into a cup of the bra, lean over and fasten the bra. Stand up and move the rice around your breast as evenly as possible. Now put on a tight fitting T shirt and see if this is the look you want for your breast enhancement. Adjust the amount of rice if you want bigger or smaller. Try on several different outfits to see how you will look in your clothes. When you have the size you want try wearing the bra with the rice when you go out and about for a couple of days and see if you are still comfortable with the breast enlargement size. Once you have determined the size, measure the rice for each breast and your surgeon will be able to determine what size implant it would be equal to. 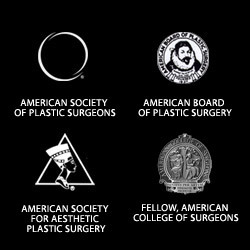 See breast augmentation before and after pictures on Dr. Delgado’s main website: www.sanfranciscocosmetic-surgery.com. This entry was posted on Monday, August 22nd, 2011 at 8:01 am	and is filed under breast augmentation, Home. You can follow any responses to this entry through the RSS 2.0 feed. Both comments and pings are currently closed. Howdy! Quick question that’s entirely off topic. Do you know how to make your site mobile friendly? My website looks weird when viewing from my iphone4. I’m trying to find a theme or plugin that might be able to fix this problem. Thanks for a very informative website. What else may I get that type of information written in such an ideal approach? I’ve a project that I’m simply now running on, and I’ve been at the look out for such info.